Paul’s letter to the church in Philippi was written around A.D. 61, while Paul was in house arrest in Rome. Paul was writing to the church that he planted while in Macedonia about ten years earlier. 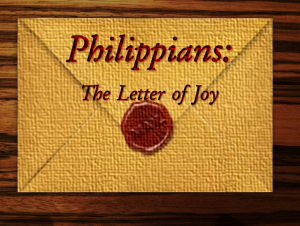 This letter is mostly a letter of thankfulness and joy, in these four short chapters, Paul mentions Joy or rejoicing nineteen times. Paul begins the Letter by introducing himself and Timothy as servants of Christ, the Greek word he used is Doulos, which means bond-slave. Picture this, Paul, the accomplished church planter, missionary, Roman citizen, premier theologian in all of history and he introduces himself as a bond-slave. Paul understood that by becoming a follower of Jesus, he surrendered all his rights, as he wrote in 1 Corinthians 6:19-20. This is what it means to be a follower of Jesus Christ. The term Holy People is usually translated as “saints”, the Greek meaning is to be set apart, separate from the rest of the people. The church is made up of people who are different and separate by being in Christ. To be in Christ, is a positional statement of being set apart unto God and exclusively belonging to Christ. In verse two Paul proclaims a blessing on them. “Grace and peace to you from God our Father and the Lord Jesus Christ”. Grace and peace are promises from God for believers in Jesus Christ. Grace is unmerited favor, getting something that we don’t deserve. Justice is getting what you deserve, mercy is not getting what you deserve and grace is getting what you don’t deserve. Additionaly, term used for peace here is more than just peace with God, it can best be described by the Hebrew word Shalom. Shalom is a Hebrew word meaning peace, harmony, wholeness, completeness, prosperity, welfare and tranquility and can be used like the term Aloha in Hawaiian to mean both hello and goodbye. Paul is reminding his beloved readers that in Christ they have received grace, and experience peace. Are you experiencing peace? True peace is not a life without trouble, rather it is knowing God’s peace in the midst of troubles (see Philippians 4:7). Maybe today you need to repent of your sins and allow the grace of God to refresh you by the blood of Jesus so that you can know the peace of God in your life. Paul continues, “I thank my God every time I remember you.” Paul must have been looking back to what took place in Acts 16 some eleven years earlier. He must have remembered Lydia, the cloth trader, the demon possessed slave girl and the jailer, all who became miraculous followers of Jesus. Paul loves these people, he has great memories of spending time with them and he is thankful to God for them (verse 4). Notice Paul’s prayers are not simply generic prayers, he remembers them and prays diligently for them because they were true partners with him in the ministry (verse 5). Paul was financially supported by churches that he planted. This letter was to his financial supporters and he thanked them for their partnership. But this partnership was not simply a one-way transaction, Paul gave of himself for the church and prayed diligently for the church that sent him finances and encouraged him. As we look at the ancient church in Philippi, we will see that we are very similar to the Philippian church, and what Paul wrote to them applies to us today in the 21st century. They were a missionary sending and supporting church. This is what healthy churches do, we must never see sending missionaries as a financial transaction, rather sending and receiving is all part of the Grace and Peace of God in the church. Looking at verse 6, “being confident of this, that he who began a good work in you will carry it on to completion until the day of Christ Jesus.” Paul is confident, he has faith that what was begun ten years earlier will continue to grow and be fruitful until Jesus comes again. Paul was confident that Jesus will build His church, just as he promised in Matthew 16:18. Sometimes we need to be reminded, that this is not our church, this church belongs to Jesus and he is continuing to work out his plans and build his church until he comes again to receive his bride. I hope you see that the church is something so much greater and more glorious than a social gathering on a Sunday morning. Even this small church, is a part of the bigger church, the universal Body of Christ, and we feel those connections through the missionaries we pray for and other Christians we meet from other churches, and as we remember and pray for the persecuted church. Growing individually and corporately as the church, is not a matter of making ourselves better people, rather it is the power of God working in us, as we lay down our preferences and allowing the Holy Spirit to work in us and through us for God’s glory. Are you daily being changed by the Gospel? If someone was to write a letter to your church, would they see the three characteristics that Paul saw in the church in Philippi. Would they see a true partnership? Are you all in? Or are you just attending church. Would they see that you are motivated by the Gospel? The Good News must be the driving force of the church. Would they see that we are looking towards Jesus coming again? This world does not offer hope, our only hope is found in Jesus Christ. In Chapter three of the book of Jonah, he finally obeyed the Lord and preached the word of the Lord to the city of Nineveh, the entire city repented and God relented from his punishment. 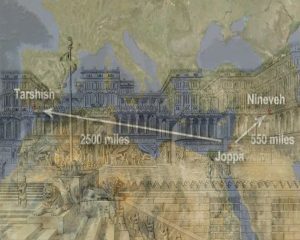 Now one would think that Jonah would head back home, happy to have been the single most successful preacher in the Bible and tell his friends of his amazing mission trip to Assyria. But no, Jonah surprises us once more and in verse one of chapter four we read, “to Jonah, this seemed very wrong…” Jonah got angry because of his prejudice. In this short chapter, Jonah gets angry with God’s withholding judgment, and he wants to die, then he gets angry about the plant dying, as if he deserved it, and he wants to die. The irony is that Jonah is angry because God is gracious and compassionate, slow to anger and abounding in love (Ch. 4:2). Jonah was the beneficiary of these attributes of God, but now when they are applied to a city that he hates, he gets angry. It sounds laughable, but, we are not much different to Jonah. Jonah was angry because he perceived God as being soft on sin and weak on justice. But Jonah did not have a healthy understanding of who God is, and neither do we. Jonah gets angry at God, the uncreated creator of the universe. There is no concept or attribute of God that is more important for us to grasp than His holiness. In the Prophet Isaiah’s vision in Isaiah 6, we read that the seraphim around the throne of God are constantly calling to each other in verse 3 saying; “Holy, Holy, Holy is the Lord God Almighty, the whole earth is filled with His glory”. The Hebrew language uses repetition for emphasis and there is no other attribute of God that is repeated three times. God’s holiness is the foundation of his being. Firstly, God is infinitely separate from all of creation, he is the creator and everything else is the creation. Secondly, God is infinitely separate from Evil, because of his holiness he hates sin with a perfect hatred. The darkest hour in human history was when God the father had to turn his back on Jesus, because Jesus became sin for us at that moment. Your sins and mine were placed on Jesus and God the father could not even look on him. The Bible calls followers of Jesus to a life of Holiness (see 1 Peter 1:16). God is not soft on sin, he gave his only son to reconcile us to Himself. God hates sin more than we could ever imagine. Jonah was angry, because he felt that the Ninevites deserved to be punished, and they did deserve punishment. However, Jonah also deserved punishment because he disobeyed God. And we too also deserve to be punished because of our sins (see Romans 3:23). So, is it right for you to be angry? The truth is that the root of our anger is primarily pride. We get angry because we deserve better, because we didn’t get our way, because our rights were challenged or because we feel we deserve respect. What about righteous anger, you may ask? Righteous anger is rooted in a deep understanding of the holiness of God. One writer states, “Righteous Anger Focuses on God and His Kingdom, Rights, and Concerns, Not on Me and My Kingdom, Rights and Concerns.” When we compare our perceived right to become angry, and we compare it to the word of God, we see that we really don’t have the right to get angry (See James 1:19-20). Often, we get angry before we know all the facts or before we speak to the person we feel has offended us. If we would be quick to listen and slow to speak, we would gain more understanding, we would grow in our relationships and we would be angry less. The reality is that out of relationship comes grace. Oh, that we would see people the way God sees them. There is a difference between wanting God to deal with sin and wanting God to destroy the sinner. God loves the sinner so much that he sent his son to die on the cross for their sins. We as followers of Jesus Christ, those who have been forgiven of our sins have a responsibility to lead the way in forgiveness. It will require much from us to see the grace of God applied to some people and to forgive those that God has already forgiven. When it comes to anger and unforgiveness in relationships, What about anger and unforgiveness in the church? There are very few instances in a church where there is true righteous anger, rather we get angry because somebody moved our favorite chair, or somebody didn’t tell us that the meeting was cancelled, or we get angry because we weren’t invited to that dinner party. All these offenses are rooted in pride. Paul writing to the Philippian church gives them some encouragement in this area, encouraging them to imitate the humility of Christ (Philippians 2:3-4). How I wish we could take this scripture to heart in our self-absorbed culture. Every year when Christmas comes around, we traditionally look at the Christmas story in the Gospels of Matthew and Luke. 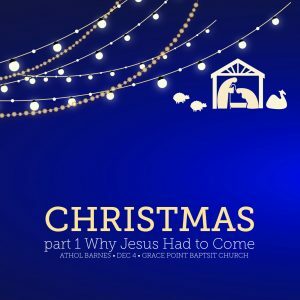 The story of a baby being born in Bethlehem, not just any baby, but the very son of God. The Christmas story is just another beautiful story unless we connect Christmas with the cross. This baby being born in Bethlehem was part of God’s perfect plan to provide a way of salvation for a lost and dying world. Jumping ahead 33 years, Jesus’ final words on the cross as recorded in John 19; “it is finished”. What was finished? The mission Jesus came to accomplish? We have to look all the way back to the first book of the Bible to see what Jesus was talking about. What Jesus came to finish began in the book of Genesis chapter 3. In the beginning God created mankind in his own image, he put something of himself in man. There was perfect communion, but then Adam and Eve sinned, and the result of this sin was a separation between God and man. All of creation has suffered as a result of the sin of Adam and Eve. The separation between God and man was so great that mankind could never cross over back to God, no matter how good man tried to be or how many laws man tried to obey. One of the most tragic verses in the Bible is verse 8; ”… and the man and his wife hid themselves from the presence of the Lord God…” The tragedy is that mankind has been trying to hide from God ever since. God knows everything, so why is he asking all these questions? God is not asking because he needs information, rather God is asking questions to give Adam and Eve an opportunity to repent. God the Father is walking through the garden with a broken heart, knowing the terrible course of events that have been set in motion. What began with two people eating forbidden fruit, would lead to centuries of pain and heartache for billions of people and ultimately to the death of his own son on the cross at Calvary. God promised that a child of Eve’s would crush the head of the serpent Satan. Eve thought that this was accomplished when she had her first son Cain as we read in Genesis 4, but Cain was even more wicked and because of his pride he killed his own brother Abel. God was not looking to the immediate offspring of Eve, he was looking thousands of years and many generations down the line to Jesus. Jesus would be the one that ultimately crushed the head of Satan. Genesis 3:15 is the first declaration of the wonderful Gospel message. Genesis 3:15 says that Satan will bruise the heel of Jesus, Jesus would suffer pain and more pain than we could ever imagine, but the wound inflicted on him would not be fatal (see Isaiah 53). But by rising from the dead, Jesus crushed the head of Satan, ultimately which will lead to his being sent to hell (see Rev 20:10). In order for Jesus to restore the relationship between God and mankind, he had to become as a man. In part to fulfill what God promised Eve, but also to be the perfect sacrifice. God had to become a man in order to pay the price for sins and the restoration of our relationship to God the Father. As a result of that first sin the problem of sin permeated the whole world, the solution had to come from God as mankind was helpless. The first step was for God to introduce himself to mankind, a way for God to connect with his creation. We could not connect with God, but he could connect with us and reveal himself to mankind. So God had to become a man, taking on flesh by being born of a woman. What an incredible concept and miracle. The creator of the universe left his throne, disguised himself as a man, and walked among us. The creator became like one of the creatures and revealed his nature to mankind (see John 14:9). As we celebrate Christmas, let us not become so wrapped up in the beauty of the lights and the tinsel and the singing of Christmas Carols, that we forget the rescue mission, the real story of Christmas that is the enormous price that Jesus paid in setting aside his glory and taking on flesh. Looking back to Genesis 3 verse 21, we read that God made clothes for Adam and Eve from animal skin. But in order to make those first clothes, God had to kill an animal, this was the first blood-shed in order to cover sin. It became the foreshadow of the ultimate sacrifice of Jesus himself. RA Crisswell wrote: Somewhere in the ground of Eden the ground drank the blood of the first offering for sin, and from that harmless and blameless creature a coat was made to cover up the shame and nakedness of the man and his wife. It is a picture of the covering, the atonement, the washing away of our sins in the sacrificial victim on the cross of Calvary.